We got mentioned in HT Brunch! My name was mis-spelt in the print version (as was my age), but oh who cares?! They called my blog “popular”!!! Cue, bigg-est smile on planet Earth! I also didn’t take an 8 month sabbatical from work (I wish! ), but oh who cares?! Note above point. You can read the full article here. Kismet of The Unreal Bride made it to the cover of the magazine! In her gorgeous, off-beat blue lehenga 🙂 In case you haven’t checked out her wedding pictures till date, you MUST! It’s absolutely inspirational. The article talks about how brides are taking charge of their weddings these days, and one of our brides – Supriya Popli – also got mentioned! Supriya was the bride I took along with me to the Anita Dongre visit, and I got really excited when I saw mentions of everyone from the wedding blogosphere whom I’ve interacted with all over the article! And a feature in Femina Brides! Page 1 – see the snapshot of our blog! 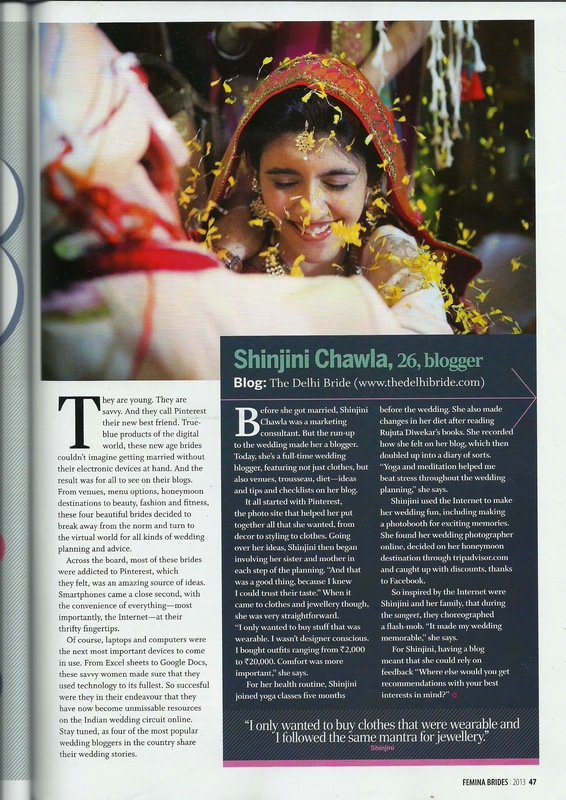 Roli of Crazy Indian Wedding told me that all us wedding bloggers had been mentioned in this article in Femina Brides. I was at my cousin’s Haldi ceremony and there were no magazine shops around! I was desperate to get my hands on the issue, when my SIL gave me a call saying she’d managed to grab a copy just as a shop was closing for the day. And needless to say, I was really happy to finally read it that night 🙂 Once again though, a few minor errors – I’m 25! Not 26. And was never a marketing consultant 😦 I’ve actually worked in Strategy Consulting (M&A deals kind of work). You are too sweet, Shruti! 🙂 Thank you for following the blog! hello TDB, i completely love your blog. It is one of the best Indian blogs I have come across. Quality posts, well organised, great content, nice look and feel. Wow, that is so nice of you Komal! You’ve just made my day!!! Thank you so much! Brilliant time coordination. Nice escape from 4 a.m. vidaai. I just got invited for a Hindu wedding in New Delhi. It reads – Baraat assembly. What is that ? I am reading your comment here where in you say Baraat assemble at so and so time and entered by 6.30 p.m. What happens to the Baraat between 4.30 p.m. and 6.30 p.m. Will be good to know, what is this ? By the way, my roots are not from India. Hi Kate! Baraat assembly means when the groom’s side of the family gathers at a place close to the wedding venue. Once everyone has arrived, the baraat dances upto the venue. There’s a whole band playing music while the baraat walks and dances and slowly makes it’s way to the entrance of the venue. Well, my co-worker and the groom said we can expect loud music at “Sangeet” event. I guess, the wedding ceremony is itself going to be loud. Appreciate your time and effort to reply me. I see, people ask you suggestion about lot of things. So, I was wondering, if you have any answer for me – Any venue in gurgaon to entertain 50 people, where I will be not be obliged to order food from the venue and will have the freedom to bring my own chef ? Thanks for sharing the e- version with me, I’d totally forgotten about this article. I wish they had referred to me by my blog name rather than Supriya but then I’ve hardly posted anything :p I was soooo excited that I sent the link to all my friends and family.